The more electricity you use, the more you pay for it. And in a world that is becoming increasingly dependent upon tech devices, something's gotta give. Luckily, there's a way to save money on those bills and help the environment, all at the same time. You just need to capture those intense rays of sunshine and use them for free energy. There are many ways you can harvest energy from the sun. Some methods are free and have been in use for thousands of years. Others require an investment in technology, but in some cases you can even make money by capturing free energy from the sun and selling it! A few years ago, it would have been unusual to spot a house with solar panels on the roof, but now solar panels seem to be popping up in neighborhoods all over. 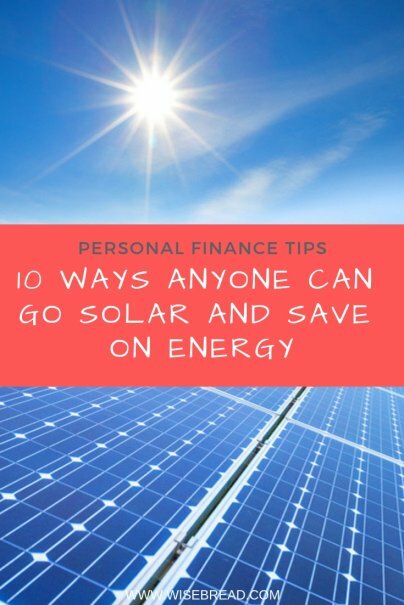 If you have a south-facing roof (or west-facing) and get lots of sunny days in your area, installing solar panels to generate electricity can be a smart investment. The cost of solar panels has dropped in recent years, and with major players such as Tesla starting to produce solar panels, further price drops and improvements in capability may lie ahead. If your solar panels generate more electricity than you use, in many states you can sell this extra energy to the utility company and make money through net metering programs. Cost: Thousands of dollars up front, depending on square footage installed. Potential savings: About a thousand dollars per year, depending on your location. DIY? No, solar panels typically require professional installation. This method of harvesting energy from the sun is not new and does not require any special technology. My house has a solarium with south-facing windows to allow sunlight to flood in during winter months. The solarium walls capture the warmth and radiate it back into the house, providing free heating. Any south-facing windows you have in your house will work to provide heating benefits in winter. Open curtains on your south-facing windows on winter days to let light and heat in. Close curtains at night during winter and when the sun is shining in during the summer. Cost: Free if you have south-facing windows. Potential savings: Hundreds of dollars per year. DIY? No, look for south-facing windows when choosing or building a house. Heating water requires a lot of energy, so why not capture some of that free energy from the sun instead of running up your electric or gas bill? A solar water heater circulates water through an insulated collector using a water tank that is painted black to maximize heat collection. This hot water can be used directly or can be fed into a traditional water heater to save energy. Cost: A few hundred dollars, depending on whether or not you can install yourself. DIY? A solar water heater can be built from plans and scavenged materials, but you may need a plumber to install. With a clothesline in your yard, you can use free energy from the sun to dry clothes and avoid running your clothes' dryer on hot summer days. You can save the energy it takes to run your dryer, plus you'll save on cooling costs as well. Without having to use a fan or air conditioner just to cool down a part of your apartment or home that's hot from a running dryer, those summer energy bills will go way down. And if you don't have the available yard space outside to hang a clothesline, you can also install one indoors near a window. Potential savings: About a hundred dollars per year. DIY? Yes, installing a clothesline is a simple do-it-yourself project. Instead of buying and powering yet another kitchen appliance, you can use free energy from the sun to dehydrate fruits, vegetables, and even meat for storage. Solar food dehydrators use a heat collection box to collect solar energy and a dehydrator box where food is placed to be dried. Potential savings: A few dollars per year. DIY? Yes, this can easily be built from plans. You can build your own solar oven and enjoy some off-the-grid cooking. Can a solar oven really get hot enough to cook food, though? A solar oven typically reaches temperatures of 250-350 F. You can safely prepare food, including meat, by cooking at a lower temperature for a longer time. A big advantage of a solar oven is that you can cook in places without any utility hookups and without burning any fuel. What does growing plants have to do with solar energy? Plants capture energy from the sun directly and use this energy to produce edible leaves, fruits, and vegetables. Harvesting food from plants is an effective and inexpensive way to take advantage of free solar energy. Potential savings: Hundreds of dollars per year, depends of size of garden. Heating of the earth's atmosphere from the sun provides the energy that causes wind to blow. If you have a site that gets a lot of wind, you can capture some of this indirect solar energy by using a wind turbine to generate electricity. As with solar panels, in many places you can take advantage of net metering and get paid for excess electricity that you generate and put on the power grid for others to use. Cost: Thousands of dollars up front, depending on size. DIY? Smaller units could be assembled and installed by a homeowner; larger units require professional installation. With a solar furnace, you can warm up air for free using energy from the sun and direct the warm air to a space you want to heat. A solar furnace can be operated independently from your main furnace to provide supplemental heating during daytime hours. Cost: Hundreds of dollars up front. DIY? Yes, this can be built from plans. Solar chargers, and solar power banks directly use energy from the sun to power electronic devices. Many are small and easy to travel with, so you won't need to stress if you're somewhere outdoors and you can't plug in your phone charger. Use those intense rays to give your phone or other device the juice it needs before the sun goes down. You can also make this a regular charging option if you leave your charger out during the day, and use it at night to charge your devices while you sleep. Potential savings: It varies, depending on how much you currently use your devices at home. DIY? Yes, but the DIY won’t save much compared to buying one.